Janelle Black died unexpectedly of natural causes at her home on February 10, 2015. Her page remains here as a happy reminder of this lively member and friend who had a smile for everyone. Talk with Janelle Black for a few minutes and you’ll quickly feel at home, as she tells about herself and her long-time love of quilting. She grew up in Glen Ellyn and attended Glenbard West High School, and later, college in St. Paul, Minnesota. She discovered quilting while in college in the 1970s when she took a class from a traditional teacher who taught only hand piecing and hand quilting. She was hooked from the get-go! When asked if she does her own machine quilting, her eyes light up as she replies, “I am looking forward to it.” Pressed for more info, she adds that after taking early retirement two years ago, she decided to buy a sewing machine to see if she’s been missing anything. Yes, you heard that right. 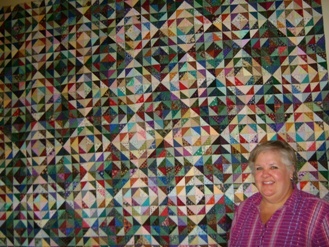 She’s been hand piecing and hand quilting since the 1970s. And loving it. Without a sewing machine. 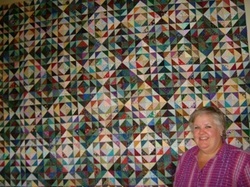 One wall of her living room displays an amazing star quilt made of hundreds of tiny pieces she hand-stitched together. 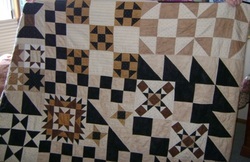 Now she is learning machine piecing and quilting! A big fan of Missouri Star Quilts website, color is what inspires her when she begins another quilt from one of their patterns. She admits she will probably always be a traditionalist at heart, that her preference will always be handwork. But there is a smile whenever she mentions that new machine. 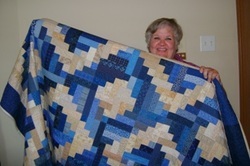 Janelle joined the guild soon after attending the guild's show, naperville quilts! 2013. Currently she is assisting Sandra Hess with Philanthropy.